Kahaniwali Nani, Sarla Minni’s audio storytelling service, has over 10,000 subscribers. “There was once a boy called Bittoo. Bittoo was always late. He always asked for that five extra minutes. One day, Bittoo was getting ready to school, when…” To know the rest of Bittoo’s fate, send a Whatsapp message to Kahaniwali Nani. 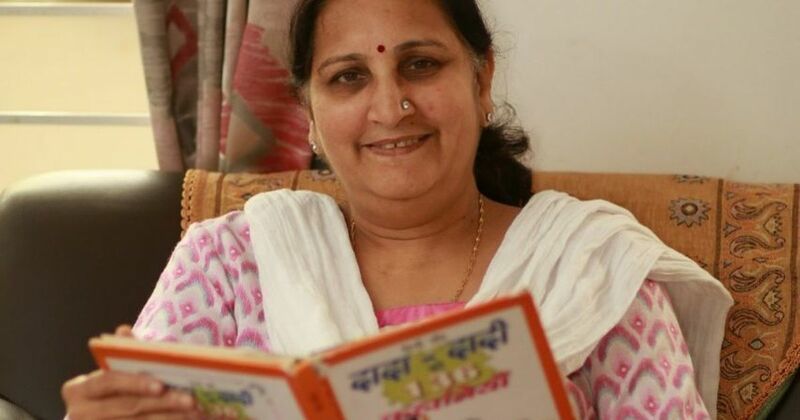 Bengaluru-based 61-year-old Sarla Minni is an extremely busy grandmother – she reads, records and broadcasts audio stories to more than 10,000 children across the world. Kahaniwali Nani, her free broadcasting service, was launched on March 21, and since then, has spread through word of mouth, becoming an instant hit with children and parents alike. Growing up in Mumbai, Minni devoured books as a child. She soon discovered that she not only enjoyed reading but also loved narrating stories, something she had a unique skill for. Years later, nieces and nephews would spend summer vacations crowding around her and listening to stories that Minni frequently invented on the spot. Minni’s niece, Baroda-based Parul Rampuria, was the first person to suggest that she record her narrations. Minni sent a few audio stories to her grandson in Mumbai via WhatsApp and was gratified by his excitement. To test the waters further, Rampuria and Minni circulated the recordings on an extended family WhatsApp group. The response was still more encouraging. Thus, Kahaniwali Nani was born. To avail the service, one simply has to send a message to Minni via WhatsApp. The person is then directed to a Google form that asks for some basic information about them, such as the name of the child, their date of birth and preference of language. The parent is then sent one audio story per week. Each story is approximately 8 to 10 minutes long. The stories are tailored to the child’s age and usually contain a moral. Minni receives a minimum of 100 requests a day, and her subscribers include parents-to-be, grandparents, teachers and even doctors. On a regular day, Minni dedicates a couple of hours to research and recording. “I read a lot of books and pick out a few stories,” she said. “I read several versions before I zero down on one. I make a few improvisations. Then I narrate and record the story, usually imagining my grandson.” The recording is then sent out to the thousands of subscribers on her WhatsApp broadcasting list. “I feel the children connect to my voice,” she said. 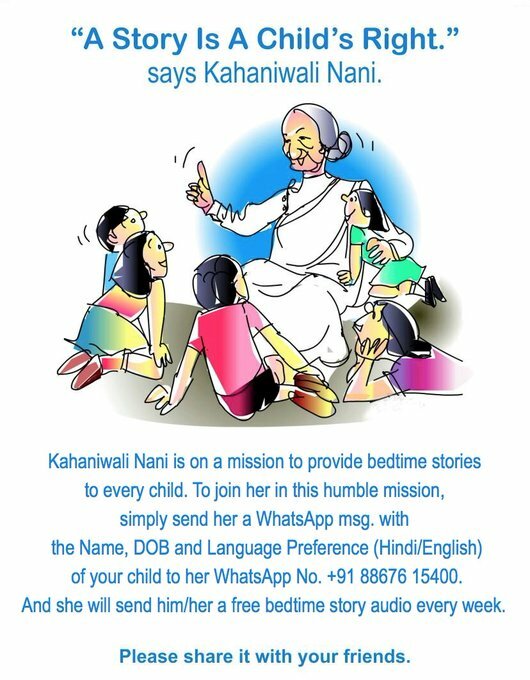 “Many of them have sent me feedback that they feel as though their grandmother is sitting in front of them.” While urban parents grapple with screen-obsessed children experiencing too much visual stimulation and overload, Kahaniwali Nani seems to be the perfect antidote – a WhatsApp service that subverts the dependency on technology by using the same technology. “Children are becoming increasingly dependent on technology and I wanted to bring back the custom of listening to bedtime stories,” Minni said. Listening to stories without distracting visuals helps in lowering children’s heart rate, calming them down and helping them sleep better. Minni said the act of listening as opposed to watching, also inculcates patience and fires the imagination. While most narratives share common tropes, like a central hero or heroine who battles a villain, she believes that the impressionable minds of two- to twelve-year-olds absorb concepts faster, when they are presented in the form of a story. Minni said a story she shared in the past, about a group of animals saving money and using it during an emergency, spurred several of her listeners to start collecting and saving money in piggy banks. Sieving through the messages and feedback she receives every day, Minni said she would never forget the call she received from a mother who lived in a village in Kashmir: “She was from a village 30 km from the border. She thanked me for the service and said that she downloads the stories whenever she can and that her children listen to them for hours.” In the absence of a formal school, and at times of prolonged curfews and erratic internet connections, Kahaniwali Nani’s stories were the only solace for the Kashmiri caller’s wards. “We love you Nani, please send us more stories,” Minni read out the latest message she received, beaming. Feedback, especially from young fans, makes her day. Of late, Minni has received several requests to customise stories and perform at storytelling events. Her other correspondents are grandparents who want to try their hand at narrating stories. Kahaniwali Nani recently launched auditions via WhatsApp, providing a platform for interested storytellers across the country. Minni wants as many children across the world as possible to have access to great stories, so she never plans to charge money for the service. 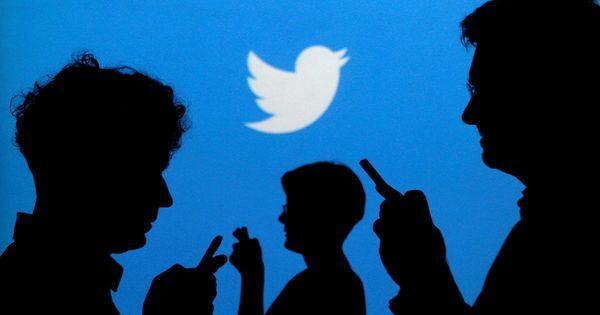 It is likely, however, that she may soon have to switch to an app – with 63 messages from 46 chats, Minni’s WhatsApp crashes several times a day.